I began working at Bethlehem Steel’s Sparrows Point Plant in 1973. I had graduated high school in 1968 in Connecticut and attended George Washington University for one year before dropping out and moving to Baltimore. While at GWU, I participated in teach-ins and building takeovers protesting the Vietnam War. In the steel mill, I became active in Local 2609 of the United Steelworkers of America. Many of my most trusted allies in the union were military veterans. 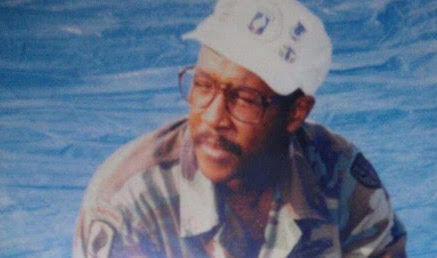 Walter Elwood “Buddy” Bantum III was one of the most memorable Vietnam veterans. He was a shop steward in the 56-66” Cold Mill, where I served as grievance committeeman. Buddy, who told me he never slept through the night since returning from Vietnam, was never afraid to stand up to racism and unfair treatment. He pushed against conservative opposition for our union leadership to recognize Dr. King’s Birthday. He founded and chaired a veteran’s committee in the local. He successfully fought to erect a monument in front of the union hall honoring our veterans. Buddy died of pancreatic cancer in 2002 at age 55. His remains are interred in Arlington National Cemetery, Plot 6-11, Row 10 Site 4. I think about Buddy often and, every August 11th, the birthday we shared, I touch base with his wonderful wife, Gina. Been gone a long time, Buddy. Never forget the last visit. We spoke between the nod outs. Gina asked me to be your pallbearer. 173rd Airborne Brigade Combat Team. looked like he’d seen some hard times. stronger in body and words. “You’re the guy who was against the War. “Y’all have a safe trip home. Been an honor to be with you. Len Shindel began working at Bethlehem Steel’s Sparrows Point Plant in 1973, where he was a union activist and elected representative in local unions of the United Steelworkers, frequently publishing newsletters about issues confronting his co-workers. His nonfiction and poetry have been published in the “Other Voices” section of the Baltimore Evening Sun, The Pearl, The Mill Hunk Herald, Pig Iron, Labor Notes and other publications. After leaving Sparrows Point in 2002, Shindel, a father of three and grandfather of seven, began working as a communication specialist for an international union based in Washington, D.C. The International Labor Communications Association frequently rewarded his writing. He retired in 2016. Today he and his wife, Maxine, live in Garrett County where he enjoys writing, cross-country skiing, kayaking, hiking, fly-fishing and fighting for a more peaceful, sustainable and safe world for his grandchildren and their generation	Contact the author.